The urban archetype of the flâneur, so central to the concept of modernity, can now experience the city in ways unimaginable one hundred years ago. Strolling around Paris, the contemporary flâneur might stop to post pictures of her discoveries on Instagram, simultaneously identifying points of interest to the rest of her social network and broadcasting her location (perhaps unknowingly). The café she visits might be in the middle of a fundraising campaign through a crowdfunding site such as Kickstarter, and she might be invited to tweet to her followers in exchange for a discount on her pain au chocolate. As she ambles about Paris, the route of her stroll is captured by movement sensors positioned on top of street lights, and this data – aggregated with that of thousands of other pedestrians – could be used by the City of Paris to sync up transit schedules. And if those schedules were not convenient, she might tap Uber to whisk her home to her threadbare pension booked on AirBnB. This vignette attests to the transformation of the urban experience through technology-enabled platforms that allow for the quick mobilization and exchange of information, public services, surplus capacity, entrepreneurial energy, and money. However, these changes have implicated more than just consumers, as multiple technologies have been taken up in urban governance processes through platforms variously labeled as Big Data, crowd sourcing, or the sharing economy. These systems combine inexpensive data collection and cloud-based storage, distributed social networks, geotagged locational sensing, mobile access (often through “app” platforms), and new collaborative entrepreneurship models to radically alter how the needs of urban residents are identified and how services are delivered and consumed in so-called “smart cities” (Townsend 2013). In the rhetoric used by their boosters, the vision and practice of these technologies “disrupts” existing markets by harnessing the power of “the crowd” – a process fully evident in sectors such as taxi (Uber/Lyft), hoteling (AirBnB), and finance (peer-to-peer lending). However, the notion of disruption has also targeted government bureaucracies and public services, with new initiatives seeking to insert crowd mechanisms or characteristics – at once self-organizing and collectively rational (Brabham 2008) – into public policy. These mechanisms envision reconfiguring the traditional relationship of public powers with planning and governance by vesting data collection and problem-solving in crowd-like institutional arrangements that are partially or wholly outside the purview of government agencies. While scholars are used to talking about “governance beyond-the-state” (Swyngedouw 2005) in terms of privatization and a growing scope for civil society organizations, technological intermediation potentially changes the scale and techniques of governance as well as its relationship to sovereign authority. Combined, these emerging platforms and practices are challenging the tactics, capabilities, and authorizations employed to define and govern urban problems. 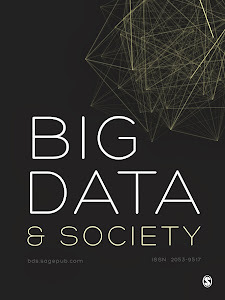 This special theme of Big Data & Society picks up these issues, interrogating the emergence of digital platforms and smart city initiatives that rely on both the crowd and the cloud (new on-demand, internet-based technologies that store and process data) to generate and fold Big Data into urban governance. The papers contained herein were presented as part of a one-day symposium held at the University of Illinois at Chicago (UIC) in April 2015 and sponsored by UIC’s Department of Urban Planning and Policy. Setting aside the tired narratives of individual genius and unstoppable technological progress, workshop participants sought to understand why these practices and platforms have recently gained popularity and what their implementation might mean for cities. Papers addressed numerous questions: How have institutional supports and political-economic contexts facilitated the ascendance of “crowd” and “cloud” models within different spheres of urban governance? How do their advocates position them relative to imaginaries of state or market failure/dysfunction? What kinds of assumptions and expectations are embedded in the design and operation of these platforms and practices? What kinds of institutional reconfigurations have been spurred by the push to adopt smart city initiatives? How is information collected through these initiatives being used to advance particular policy agendas? Who is likely to benefit from them? The four articles in this special theme take different slices on these questions. Robert Lake’s analysis reviews the ontology and politics of Big Data practices beginning with the recognition that issues of definition and politics are fundamental to data collection in cities. From this foundation, he focuses his paper on the concern that Big Data suffers not only from the politicization of practice, but from its foundational ontological premise of “hyper-individualism” – i.e., or treating persons, events and phenomenon within a city as independent units unconnected to each other or to any larger context. Similarly, John West’s research focuses on the abstracting logics of Big Data in the case of a large public school in the Bronx and how Big Data systems, implemented with the laudable goal of increasing transparency, instead resulted in what he terms new “opacities.” West argues that by opening new scales of analysis for comparison and benchmarking – the teacher, the classroom, the school – this Big Data exercise transferred knowledge and power from classroom and principals to central city administrators, facilitating systemic reorganization to the detriment of the quality of this particular high school. Taylor Shelton’s article draws on the concept of “performativity” to argue that the sources of Big Data are changing the way decision makers are conceptualizing the city, resulting in changes to the types of policies and interventions that are planned. He critiques the “new urban science” that seeks to borrow methods drawn from the natural sciences and apply them to urban geography and planning. Such a borrowing ensures that quantitative analysis is the only correct approach, resulting in an ontological definition of the city reduced to whatever is most easily counted and valorizing technical expertise while issues of injustice or local concerns are rendered less important. Matthew Zook first reviews the genealogy of key ideas within smart city governance and earlier antecedents generated by motivations for social justice and progressive socio-economic reform that differ quite markedly from the goals emerging from today’s technology and neoliberal rhetoric. Recognizing the promise of Big Data for urban governance, he also cautions that “metrics don’t simply measure; in the process of deciding what is important and possible to measure, these data are simultaneously defining what cities are” (p. 15). As a collection, these papers offer insights into how future research into smart city initiatives might examine the nexus of Big Data and urban governance. Their contributions can be read as both methodological and political. By combining close attention to the work of socio-technical systems of measurement with institutional ethnographies or studies of policy-making controversies, the papers show how data is enmeshed in the dynamics of austerity, privatization, or neoliberal urbanism more generally. Here, smart city initiatives might be read as institutional practices of control, rooted in attempts to produce an actionable future out of a chaotic and ever-changing present. Whereas this necessarily highlights how data systems strip urban problems out of their context to make them actionable for policymakers – a point reinforced by all the papers – it also shows Big Data's highly-productive role in animating the thick relational entities known as institutions. Whether we're looking at the apparatuses of urban security or the role of data analytics in restructuring public school systems, the hyper-individualism of measurement (as noted in Lake's paper) is but one moment in a rich process of institutional transformation.